On Jan. 14, Dietrich Theater program coordinator (front, from left) Margie Young, Dietrich cultural program director Erica Rogler, Tunkhannock Public Library director Kristin Smith-Gary, and Mehoopany Area Library director Ina Hunter share with the Wyoming County Commissioners the details of the annual Wyoming County Reads program and early reports of success. For a 10th year, the Tunkhannock Public Library and the Wyoming County Cultural Center have partnered to promote reading and the associated arts with the 2014 Wyoming County Reads campaign. In an ongoing effort to attract a broader audience to the multi-faceted program, organizers selected two books this year and re-envisioned how the campaign would conclude. Rather than encouraging county residents to read the same single book this year and attend one or more of numerous discussion groups, TPL and the Cultural Center have selected a pair of books that span centuries but, when read in tandem, demonstrate that extreme moral judgment is as fervent today as was a century and a half ago. “There are many similarities between these books,” said Erica Rogler, cultural program director at the Dietrich Theater. 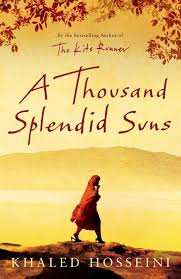 Rogler announced that the featured books this year are Nathaniel Hawthorn’s “The Scarlet Letter” and “A Thousand Splendid Suns” by Khaled Hosseine (above). Both books deal with the oppression of women, which is why, rather than simply screen the film version of the featured book as in previous years, Wyoming County Reads will wrap up with a a seminar that is geared to increase awareness of violence against women. The campaign kicked off at the beginning of the new year, and TPL director Kristin Smith-Gary was pleased to announce that all but one copy of “The Scarlet Letter,” written in 1850 and set in Puritanical 1600s New England, were quickly signed out. They will be returned of course and available for borrowing by other readers. “People are excited about ‘The Scarlet Letter,’” said Smith-Gary. “I thought that most people had read it in high school.” Because the book is a classic, she added, it can be downloaded on Kindle for free. 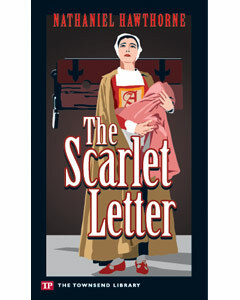 Dietrich Theater program coordinator Margie Young noted that 11th-graders at Tunkhannock Area High School are currently reading “The Scarlett Letter” and will receive extra credit for attending one or more of the book discussions, which are scheduled for Wednesdays in February and into March. “A Thousand Splendid Suns” is set in 21st Century Afghanistan and follows the tumultuous lives of two Afghan women from the 1960s to 2003. Free discussions led by Bill Chapla and special guests Dr. Len Gougeon and Suzanne Fisher Staples will be held on Wednesdays, Feb. 5, 12, 19, 26, March 5 and 12 at 7 pm at TPL. Fisher Staples will share stories about her experiences in Afghanistan and her insight into Afghan culture on Feb. 19. Additional discussions will be held at the Mehoopany Area Library on Thursday, Feb. 14 and at the Nicholson United Methodist Church on Monday, Feb. 10. Probation Officer, Drug and Alcohol Specialist. Marnie Hiester-Idec, Professor of Psychology at Misericordia University, will moderate the discussion. Commissioner Tom Henry commended library and theater associates for reaching a 10-year milestone with popular program. “It seems like you just got started,” Henry remarked prior to reading an official proclamation of the Wyoming County Reads program. “I look at the library and the theater as jewels in this county,” Commissioner Ron Williams added, noting that both entities were established under their current charters at about the same time. For information, readers may call the Dietrich Theater at 570-996-1500 or TPL at 570-836-1677. 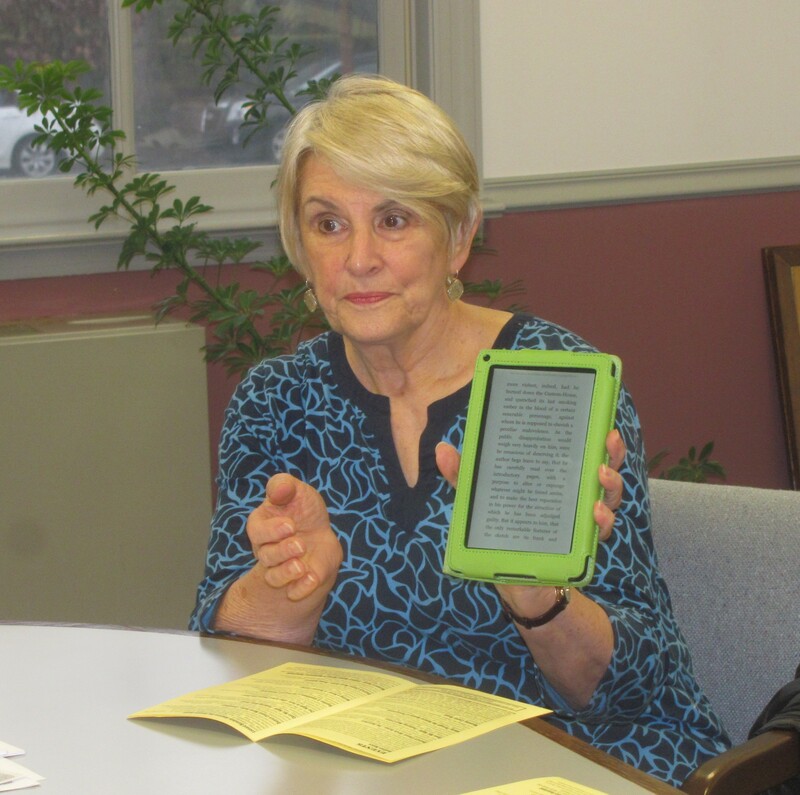 Dietrich Theater program coordinator Margie Young demonstrates to the Wyoming County Commissioners how easy it is to download and enjoy this year’s books on a Kindle reader.